Would you like to diaper your baby for FREE? You may recall a post I wrote last year where I explained how you can diaper your baby for only $50. With the state of our economy parents are finding themselves making choices between buying diapers, clothing, food, and shelter. The easiest way to use the fabric is to make a flat or prefold from the fabric (you may not even have to sew to make these). Kim at Dirty Diaper Laundry has a series of posts on the different ways to fold flat fabric for diapers These will require the use of a diaper cover to keep your babies clothes dry. You can use fleece or wool fabric to make a diaper cover, shorties or longies. When shopping at consignment stores, thrift shops, and Goodwill stores you may also find pull-on diaper covers like the Bummis Whisper Pants for only a few dollars. I created a Pinterest board with some of my favorite links about how to make cloth diapers using found items – Free Cloth Diapers. Making your own cloth diapers can save you some money and allow you to provide food and shelter for your family when times are tight. Even if you don’t have laundry facilities it is possible to hand wash your diapers in your tub or using a 5 gallon bucket and a plunger. Sweepstakes and Contests! There are hundreds of giveaways you can enter to win free diapers and accessories. Giving Diapers, Giving Hope. A non-profit organization that offers assistance to low-income families by loaning diapers for them to use. There may be a similar organization in your area (or maybe you want to start one) like Let’s Cloth Diaper Sarasota that serves the communities around me. Why did you start cloth diapering? Was it for financial reasons? Have you made your own cloth diapers? 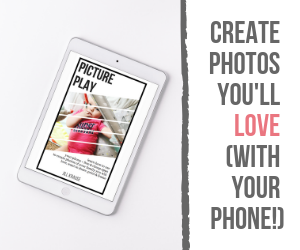 I’d love to hear your story – leave a comment below! 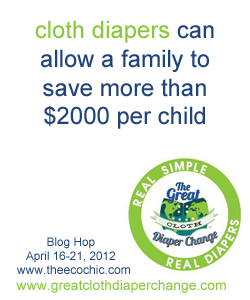 Have you heard about the Great Cloth Diaper Change yet? Leading up to Earth Day (April 22nd) the Real Diaper Association (a non-profit cloth diaper advocacy group) is hosting Real Diaper Week (April 16-21st) and the 2nd Annual Great Cloth Diaper Change (April 21st). Learn more about how to cloth diaper on an extreme budget by participating in the 2nd Annual Flats Challenge with Dirty Diaper Laundry. Yeah! My favorite subject, saving money! I have a great stash and I think last time I calculated I had spent less than $100! Now with baby #3 on the way I will probably splurge on a few diapers but won’t have to spend nearly as much as I did before. I love Real Diaper Week! Cinella recently posted..Real Simple, Real Diapers *Twitter Party* TONIGHT! What pattern is being used in pic and is it free!? Sarah B. recently posted..10 Months Old! That’s what I get for opening up this post hours ago and only replying now. I wish I was handy enough to do this!! Jealous of the handy skills! This is exactly how I did mine. Had no idea what I was doing, hadn’t even seen a “real” fitted cloth diaper. We didn’t have a computer or internet then. I used a diaper cover pattern for decorative diapers which ended up not working very well, so I had to alter them after the baby came and they worked well. I haven’t yet made a cover that doesn’t wick, but I wait for Cotton Babies to have a seconds sale on the econobum covers for $5 and stock up. I am an amature sewer and had saved all my old sheets and things over the years and ended up using them for the diapers. I knew I’d use it one day! Now I still buy flannel sheets at the thrift store. My son is 1 and a half and I’m still using the original batch I made! I was so happy they worked, I was so afraid all that work would have been in vain. Now waiting on baby number 2 and making newborn diapers. So excited to try them! My first batch of cloth diapers I made myself. I used fabric I had for the outer part and flannel sheets for the insides. The worked well enough to use at home. When our next child was born, if anyone asked what they should get us for a gift I would direct them to a cloth diaper site and a couple of local stores that sell them. Also I got hand-me-downs from a few friends. We cloth diaper our son exclusively – even on vacation. We choose hotels with a laundry! Easy peasy! I have always wanted to cloth diaper – a conscientious child, I was. The environment was my main motivator and still is. When I discovered how awesome modern cloth diapers are and what disposables are really made of, I was even more certain of my decision. My husband and I are both very proud of our cloth diapering home and I encourage everyone I meet to do the same. I don’t hesitate to whip one out and show it off. People are always impressed! It’s a great feeling. P.S. I work full time and so does my husband and cloth diapering has never been something we don’t have time do to – we are never up in the middle of the night desperately washing and folding diapers. I shudder when I hear people use “time” as an excuse not to use cloth. Like all things; if it’s important to you, you will make time.